This past Valentines Day, we saw New York Rangers’ defenseman Dylan McIlrath drop the gloves with Wayne Simmonds of the Philadelphia Flyers. The theme of the day was retribution for a sucker-punch that Simmonds laid on Rangers’ captain Ryan McDonagh just a few games prior. The rest of the match following the fight had a certain edge to it that’s lost when less familiar teams meet. The fun of the game got me thinking of other classic Ranger games against heated rivals and led me to compose a list of the best ones that the team has to date. I tried to keep the descriptions somewhat brief because you could write a full book on each rivalry individually. The Rangers and Bruins have a long and storied history; sometimes those accounts start to dwindle, especially when the two teams are in different conferences. One reason that these two teams still have a simmering rivalry today has to do with two main reasons; one, is that both teams have been competitive over the past decade, and two, is that both teams (mostly the Bruins) have been assembled with grit leading to chippy hockey. The last time the two clubs met in the playoffs was in 2013 where the Rangers were dispatched in five games. In the post-season, the Rangers are 3-7 all-time against Boston, two of those losses were for The Stanley Cup. The hostility took on a different look in 1979 when the Bruins climbed into the stands in Madison Square Garden for a brawl with the fans. Since then the Bruins logo inspires a certain feeling in Rangers fans that still comes out when the modern game gets chippy. Another part of this rivalry, in my opinion, has to do with the people of both cities just being used to not liking one another. So heated rivalries in Baseball, Football, and Basketball have helped keep the once simmering Rangers/ Bruins rivalry cooking, even if it’s not on the front burner right now. Another Original Six foe; the Rangers and Canadiens have met 15 times in the post-season over the course of their history with the Rangers holding the slightest of edges in wins taking eight of those. The Rangers took their most recent meeting in six games in 2014 sending them to the Stanley Cup Finals where they would fall to the Los Angeles Kings. When the two teams meet, there’s usually high energy, but they don’t have those games where it seems like everyone is getting into it after the whistle. That’s because both teams in recent years have played a fast brand of hockey, so there aren’t too many of those trench battles on the boards. That said there was still heated moments to be discussed, like when Max Pacioretty ran in Henrik Lundqvist, resulting in the usually composed netminder throwing punches. We can also look at Chris Kreider taking a hard cut to the net that ended Carey Price’s playoffs early, and of course, there’s former Rangers’ favorite Brandon Prust throwing a hard, late hit on Derek Stepan. This hit did break Stepan’s jaw; it also threw some gas onto a fire that was already starting to burn in the series. Rangers-Flyers is a series that’s seen plenty of grit over the years, and even if the teams aren’t on top of one another in the standings, there’s still animosity when the teams meet. The Flyers have beaten the Rangers six times in the post-season out of 11 meetings, most of which took place in the 80’s. The most recent playoff series between the clubs took place in 2014 where the Rangers were able to repel their rivals in seven games, winning the finale by a final score of 2-1. Now the playoff history certainly adds context to the bad blood. Some of the gas that keeps the rivalry hot has to do with the proximity of the two clubs, the general way that the teams have been constructed (gritty players), and the rivalry between New York and Philadelphia on all sports platforms. These games are always physical, and not necessarily in a clean way. It seems like whenever the clubs meet there are huge hits and at least, one scrap. Sometimes both. The two clubs have been battling for years, and that’s why they are one of the featured Wednesday Night Rivalries annually. The clubs have met in each of the past two post-seasons, and two years ago the tide of the rivalry seemed to turn when the Rangers were united by the passing of Martin St. Louis’ Mother. The team came out on fire and turned a Penguins 3-1 series lead into mush to win in seven. When the clubs met the following year, the Rangers just seemed to be on another level, blowing the Penguins out in five games. This one is different from a physical standpoint, because, despite tight, tough hockey, there aren’t a whole bunch of scraps, and after the whistle junk. For New York, Sidney Crosby is the target in the rivalry, and for Pittsburgh, it’s currently Marc Staal. The heat of the series jumped when Lundqvist and Crosby had some words at the end of the play which resulted in the center chopping the goalie. But the most recognizable scrum was where Crosby chops Dominic Moore in the mid-section, then, starts cross-checking Staal, to end up on his back without a helmet and a face full of water. If these two clubs face-off again in the post-season I suspect it will be a heated affair, there’s been bad blood between the clubs for a while, but I’d have to say I think it’s at the hottest point right now. The two teams are close in proximity, and a huge part of this heated affair is the playoff history between the two clubs. In 1994 the Rangers ousted the Devils in double overtime on the infamous Stefan Matteau wrap-around (Matteauuuu-Matteauuuuuu-Matteauuu, you know the call), the series was an absolute war featuring three double-overtime games and plenty of physical play; not to mention a great goaltending duel between Martin Brodeur, and Mike Richter. The Rangers would go on to beat the Vancouver Canucks and win the Stanley Cup that season. The rivalry is certainly still there, but without such characters that genuinely don’t like one another, things have cooled a bit, that being said with the Devils getting better every year, all it will take is a spark for these teams to be at each others throats again. The Rangers and Capitals have run into each other a few times in the post-season now; they’ve met nine times in their history, and five times since 2009. The last three times they’ve played one another they’ve needed seven games to find a winner and the Rangers have come out on top all three times. 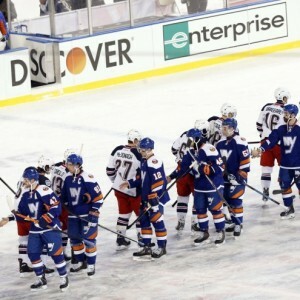 The newest Rangers’ victory came in overtime with Stepan picking up the loose change in front of the net to send his team back to the Eastern Conference Finals. This is easily one of the Rangers hottest rivalries at the moment; they’ve played so many classic games over the past few years, in high-pressure situations that it’s easy to see why the intensity rises when they square off. When these teams kicked off this recent rivalry in 2009 there wasn’t much animosity because the Capitals were a much better team, and there wasn’t that much history, but now that the years have drawn on, and the teams have evened out thing have gotten grizzly. With so much skill on both sides between guys like Henrik Lundqvist, Alex Ovechkin, etc. It’s easy to see why this is always a classic match-up. New York vs. New York, I mean how much more do I have to say. What makes this battle unique, is that it doesn’t require recent playoff wars to have intensity, in fact, the teams haven’t met since 1994 when the Rangers swept their neighbors 4-0. Whenever they play there’s that feeling in the game where everyone’s finishing hits, and playing nasty; the game simply has that edge that is often lost in an 82 game season. If you ask me a big part of that is the fans who are engaged as soon as the puck drops. No matter where they play, both sides are always well represented which jump starts the atmosphere. This series has had its brawls and rough moments. Two that jump out to me are the Chris Simon slash to the face of Ryan Hollweg, and the infamous goalie fight in 1998. To me the most defining moments of the rivalry don’t have anything to do with the fights and the scrums, this rivalry is about the incredible games that have been played, as well as the climate created by the fans when the teams clash. This clip from 1984, where Ken Morrow eliminates the Rangers does an excellent job of showing the kind of intensity in that game. This is the kind of feeling that is still in the building today. To choose the best rivalry of the bunch, I considered the history of the clubs, the current state of the competition, and the general feeling that I get from fans. That said I’ve decided that The Battle for New York takes the cake for the teams best rivalry. Now I know that the two teams haven’t met in a while in the post-season, and there’s no guarantee that they do this year, but I assure you that whenever these teams play, there’s an edge to the game. If you look back through history you’ll see the Islanders coming into the Rangers territory, and winning four Stanley Cups, massive scrums, intense playoff wars, and now both teams are good and in closer proximity than ever. What could be better for the sport of hockey? If the teams do face-off in the post-season, I suspect that it will be the series that every fan keeps an eye on similar to the Flyers-Penguins series from 2012.